I was super psyched when I received this helmet. Honestly don't think I've ever been that antsy about a helmet. First impression out of the box was that the quality seemed up to par with some of the more expensive options, but the styling was so much nicer! Extremely lightweight and the exterior was perfect. No blemishes or nonsense, it was exactly as it should be. The interior was extremely nice. The hand-sewn brushed lycra liner is super soft and comfortable. Never seen that before in a helmet. Actually almost seems like there is care put into each liner. The only downfall to this helmet is sizing! It does RUN BIG. I did not heed lowbrow's warning about "sizing down" and went with what I thought I needed...and it was too big. So I will be returning it for the right size. I will probably pick up another one for the wife. Just need to offer that XS size option! Otherwise, zero complaints with the helmet or the customer service from Lowbrow Customs. Great work guys. Thanks! Gringo S is the BEST! 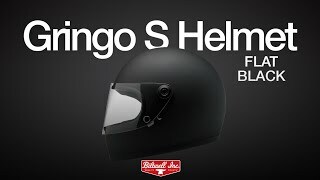 I’m a 28 year old female and it’s hard to find a good helmet with a peanut head. 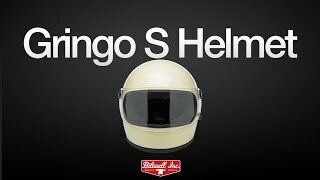 The Biltwell Gringo s in XS fits like a charm. I got the flat black, came quickly and with a gnarly sticker. Two thumbs up! On my first long ride with my Gringo S the right side hinge hardware departed on a dark, cold and wet Wisconsin morning. Duc tape to the rescue, as usual. It's a nice, comfortable helmet though. If you have one of these lids, carry an extra set of hinge hardware or just go to Home Depot for a bolt and washer (which is what I did). Also, careful of the little plastic discs on the hinges as well. A spot of silicone will keep them in place. This is a great helmet. I have rode almost 10,000 miles in it and have no complaints. I use the smoke shield 365/24/7 and love the versatility! 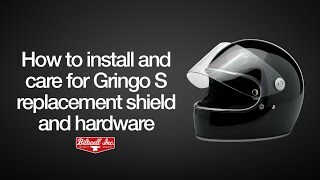 My wife also has the Gringo LE and also loves it. Being able to flip up the shield is great and I don't fog up any more, as I did with my many bubble-shields. For a full face helmet, this is a comfortable choice. Feeling is very secure and easy to size (for me). The cost is not bad as well for the quality being received.